It’s time to once again go back to the future for a look at some media related to the film series. Back to the Future: The Ultimate Visual History, by Michael Klastorin – I actually first became aware of this book from a Tor blog mentioning that it gave a blurb for George McFly’s novel. Actually, that makes me wonder what George thought when Star Wars came out. The planet Vulcan was a Star Trek reference, but that’s more the sort of name someone could have come up with on their own. After all, most of the planets are named after Roman gods. 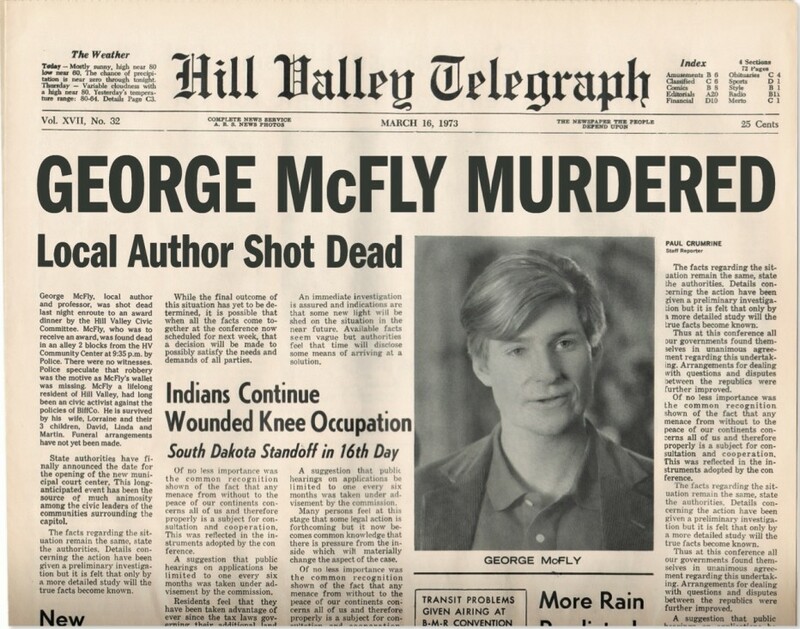 Anyway, the book has a lot of prop reproductions like that, including the flyer about the clock tower and the newspaper discussing George’s death in the timeline where Biff shot him. Unfortunately, they’re not as detailed as you might have hoped, being mostly just junk language. This was long before HDTV, after all. The text and pictures give a behind-the-scenes look at the making of all three movies, including script ideas that were dropped and how some scenes were filmed. Definitely worth a look if you enjoyed the trilogy. What with all the inserts, it’s also a good collector’s item, although I actually checked it out from the library. The book includes a look at other media based on the franchise, including the ride at Universal Studios, which I believe has since been replaced with a Simpsons ride. There was also a bit about the animated series, which I remember watching when I was in high school. It built off the end of the third film by having Doc Brown, Clara, and their kids Jules and Verne living in then-modern-day Hill Valley. They had access to both the DeLorean and the time train, which were capable of instantaneously changing location when making time jumps. I suppose they didn’t want to limit themselves to California. Marty is also involved, and occasionally has to learn a lesson, but for the most part it’s the kids who provide the catalyst for the adventures. Jules is a nerd like his father, and Verne a troublemaker. Marty’s immediate family never appears, but some of his other relatives do show up in other time periods. So do various Tannens, all of whom look, talk, and act a lot like Biff. For the most part, I don’t think they really addressed the language barrier when traveling to foreign countries, although I do remember one set in ancient Rome featuring an automatic translator invented by Doc. There are occasional goofy cartoon elements, like Einstein driving the car, two people constructing a hot air balloon from scratch, and Marty being able to walk on a tightrope because he has used gum on his shoes. 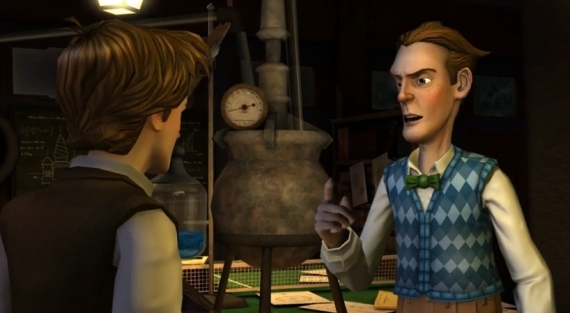 Mary Steenburgen voices Clara and Thomas Wilson the various Tannens; and while Christopher Lloyd doesn’t voice the animated Doc, he does open and close every episode with a live-action bit where he sets up the story and performs a science experiment. Bill Nye, in the days before he had his own nationally syndicated show, plays his mostly-silent assistant. 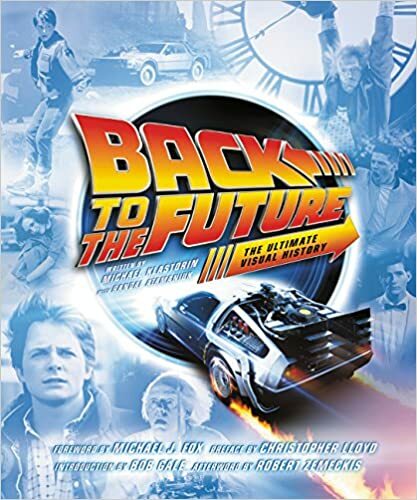 Back to the Future: The Game, made by Telltale Games in 2011, is only given a brief mention in the book. It was, however, on sale on the day in which Marty arrived in the future, so I decided to try it out. It’s a point-and-click adventure, where objects in the environment with which you can interact generally turn out to be important. I don’t think it has much replay value, as there’s only one solution to each dilemma, and if you get something wrong you can retry as many times as you like. Some puzzles have solutions that are pretty obvious or become so after you’ve explored the area and talked to everyone, but I did find myself checking the hints fairly often. There were just some instances where, even though the tools were all right in front of me, I couldn’t think how they fit together. I suppose I don’t always think the same way as the game designers. The story and humor are quite enjoyable, and very much in line with the movies. While Hill Valley isn’t a totally open environment, there are many locations you can examine and conversations you can have that show the developers put a lot of work into it. The game starts in 1986, with Doc having disappeared for a few months. When the DeLorean and Einstein mysteriously show up, Marty discovers that Doc is stuck in 1931, having been wrongly arrested for burning down a speakeasy. Marty has to enlist the help of Doc’s younger self, who is too afraid of his father to pursue his dream of being an inventor. Also appearing in that time’s Hill Valley are Biff’s bootlegger father Irving “Kid” Tannen, Marty’s grandfather Arthur McFly, Jennifer Parker’s policeman grandfather, and Vice Principal Strickland’s busybody moral crusader sister Edna. Not surprisingly, Marty and Doc end up inadvertently changing the past, resulting in several trips back. In one timeline, Marty unintentionally gets young Emmett together with Edna Strickland, and the two of them go on to turn the town into a 1984-style police state. Christopher Lloyd provides the voice for Doc, and Michael J. Fox makes brief appearances as Marty’s great-grandfather William and some future versions of Marty. Thomas Wilson wasn’t involved, but I understand there’s a deluxe version is which he did participate. The original version was released in five installments, and is still sold that way, with each part running as a separate game. One oddity of this is that you can choose between three different aliases in the first part, but all the others automatically use Sonny Crockett (a character from Miami Vice). Tha game is definitely a huge improvement over the NES BttF games. When looking at what might be considered officially unofficial media, which had involvement from the creators but isn’t actual canon, I tend to look for how well certain elements fit together. While the game never directly references the animated series, there was a cartoon episode with a Confederate Civil War general named Beauregard Tannen, and the game has a character of that name who opens Hill Valley’s first saloon. The timeline works out as well, since the saloon opens in 1876. Beauregard must have sold the place prior to 1885, as his son Buford doesn’t appear to have any stake in it in the third film. It does, however, nicely parallel with a never-used script element from Part II in which Biff’s son owns the Cafe 80s in 2015. I also found it interesting that early scripts called Marty’s son Norman, while in the finished film he’s Marty Jr. Not that that’s uncommon in real life (hey, my wife has the same name as her mom and grandmother), but you’d think fiction writers would want to be more creative. I’m reminded of how an early description of the Simpsons episode “The Blunder Years” called Smithers’ father Ernest K. Smithers, but the episode itself made him Waylon Smithers Sr. There’s a Biff Tannen Jr. in the BttF animated series, who might or might not be Griff’s dad. Another thing never officially established in the movies is Doc’s age. Apparently the novelization says that he’s sixty-five in 1985, but in the game he’s definitely older than eleven in 1931. This entry was posted in Book Reviews, Cartoons, Humor, Video Games and tagged back to the future, back to the future part ii, back to the future part iii, back to the future the animated series, back to the future the game, bill nye, christopher lloyd, mary steenburgen, michael j. fox, michael klastorin, telltale games, thomas wilson. Bookmark the permalink.